The Irish Times, along with other conservative news media, has made some valiant attempts in recent months to defend the political legacy of the Irish Parliamentary Party leader, John Redmond, principally by ignoring his greatest contribution to the story of this island nation; namely his acquiescence to unionist and British demands for its partition in the first two decades of the 20th century. Unfortunately for the neo-Redmondites of the right-wing press we have the contemporary records and accounts of history to parse their revisionist nonsense against. As far back as 1914 an illustrator with the satirical Puck magazine in the United States aptly summed up the politics of Ireland in the years before the Easter Rising of 1916. 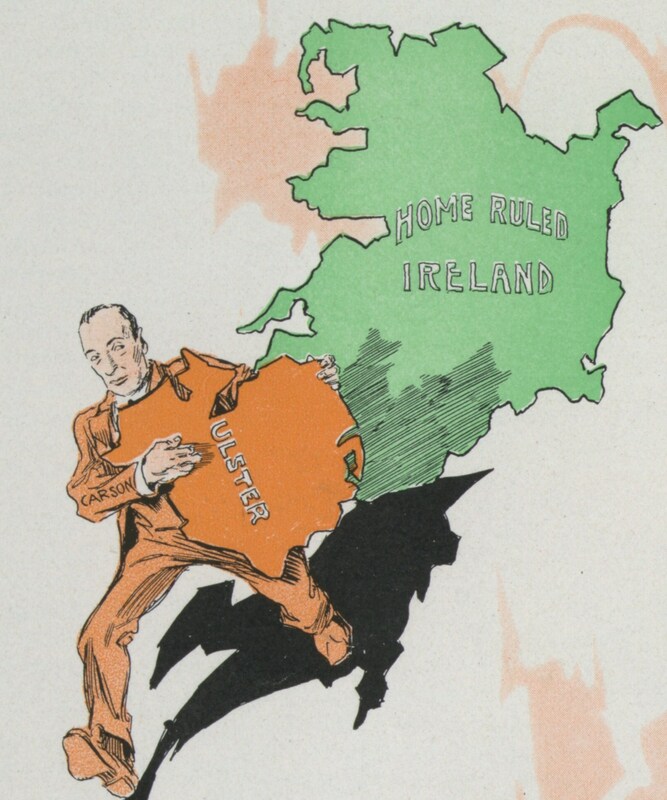 What Redmond and his fellow preachers of appeasement had agreed to in the UK’s Government of Ireland Act 1914, the so-called Third Home Rule Bill, was a country divided between two rival regional assemblies: one administrating twenty-four or twenty-six counties of “Southern Ireland” (essentially the provinces of Leinster, Munster and Connacht) and one administrating nine or six counties of “Northern Ireland” (possibly all of the province of Ulster). In effect, two glorified Stormonts, one in Dublin and one in Belfast, each in direct opposition to the other. All real power would have remained with the Imperial Parliament and government in London and the existing colonial authorities of Lord Lieutenants, Secretaries of State, Under-Secretaries and Privy Councillors at the Viceregal Lodge and Dublin Castle. The “parliaments” would have been talking shops, with no say over taxes, the economy, education, health, policing, the judiciary, defence, foreign relations and so on. In other words, all the things that matter. What John Redmond and the IPP (and Carson and the Ulster unionists) claimed as victory in 1914, and what their apologists continue to claim, was nothing more than hollow shells, institutions with less authority than a county council. The modern nation state of Ireland was born in the crucible of 1916, not in the St. James’ Street clubs and Westminster lounges of 1914 and the years that proceeded it. The same could be said when the Scottish parliament was (re)established a few years ago as a ruse to ¨kill nationalism stone dead¨ in the words of one politician. Indeed that was my view at the time. However as we´ve seen it´s been possible to use that institution, and the limited powers available, as leverage to advance the perception of Scotland as a nation and to claw back more and more power from Westminster. Who´s to say a similar gradualist (and peaceful!) approach might not have worked in Ireland? It should perhaps at least have been given a chance, with resort to violence only if/when it became obvious to a significant proportion of the population that the Brits were taking the piss. But the “parliament” in Dublin had zero powers compared to the Scottish parliament, even in its early stages, and was an instrument of partition. If Scotland had seen Glasgow and the Borders hived off under their own parliament in 1999 then it would have some similarities to the 1914-20 version of Irish Home Rule. The litmus tests for all these “what ifs” can be found in the plebiscite-elections of 1918 (general), 1920 (local) and 1921 (general). In all three cases the vast majority of those who voted did so in support of Sinn Féin and/or nationalist parties in favour of independence/autonomy. The republican/nationalist vote was 80% or more in each poll. These people voted knowing that Dáil Éireann, a revolutionary parliament, would be enacted or continue to enact as a result of their votes. So when the people of the island of Ireland opted for independence on three occasions at the ballot box, in quick succession, the British refused to accept to the results and tried to suppress their democratic wishes. We don’t need to play the alternate history game when the actual history illustrates exactly what would have happened. And did happen. While it´s natural and probably necessary to characterise Westminster politicians as a bunch of eejuts, that can´t really be the truth, for at the very least they have clever and generally prudent advisors to guide them. So why go against the will of you say 80% of the Irish electorate in the past, or indeed impede Scotland´s path to independence in the present, when a little compromise at an earlier stage might (maybe??) have produced a stable federation of some sort. Instead they dug in their heels over Ireland 100 years ago, and now seem to be doing exactly the same over Scotland, and that which will not bend when a force is applied must surely break. What after all was in it for the UK. I can´t imagine they/we benefited in any way from the endless strife across the Irish Sea? That’s how Empires work – has nothing to do with democracy. Britain was determined to deny Irish self-determination at all costs and as Seamus has pointed out, the vast majority of Irish people had voted overwhelmingly for an independent 32 county Ireland. Thus, we had to eject Britain out of our country, 5/6 of it thus far, with the remaining 1/6 bit a work-in-progress. You haven’t ejected anything. After you got independence you created an English speaking mini-England. Sounds like you know what you´re talking about. Have you had an equivalent experience? Or your parents´ generation more likely? Nationalism, imperialism, territorial integrity, racism, opening the door to other anti-colonial movements, exposing Britain’s western flank, the loss of land, property and income to the Anglo-Irish aristocracy (a far bigger factor than as been acknowledged, and which I intend to discuss here in the near future), the psychological factor of compromising with England’s oldest enemy, and so on. Britain at the start of the 20th century is not Britain at the start of the 21st. The past really is a foreign country. The Rising didn’t happen to win Home Rule, but to try and achieve a Republic. There was no ambiguity in their stance, nor that of Redmond who opposed the Rising from the start. I don’t disagree with the idea that John Redmond and his party had integrity. But the facts would indicate that they were wrong not that they lacked integrity. There is a difference as Danny Brown says. We have two conflicting ideas and we have no reason (or have we) in believing that both were held with sincerity, which perhaps is the definition of integrity – or is it? The bitter, hate-mongering Jānazi vomits up more of his bile. You should not allow your bitterness to expose your blind hatred for Ireland and the Irish nation. Your blind hatred for several other nations has been well noted too. Shameful that cowardly Latvia surrendered without even putting up a fight when the Soviets knocked on the door – but instead took up weapons and collaborated with the Nazi’s in the murder of thousands of their innocent fellow Latvian civilians in WW2. Fine – but Janis is well offside and you know it Seamus. Diversity is one thing – but gross disrespect is another. He has made a decision to earn his living here and avail of our democracy as a guest of our Nation – releasing his personal bitterness via this website is not much of a contribution to Ireland in all fairness. If he detests Ireland that much he can always go elsewhere – Latvia for example, but evidently, he prefers to live in Ireland, a country he loathes. If Janis has something to offer apart from his vomit then fine – but otherwise then he can expect to get both barrels. From my POV over the water, our Friend from the East seems to be simply pointing out a few painful home truths about Ireland. Since you´ve let him in to your country you might as well take note of his impressions, from his own perspective. Who knows you might even learn something. What you take as normal, because that´s how it´s always been, to him appears the height of hypocrisy. Taking a sort of bird´s eye view without getting bogged down in detail, Ireland and Latvia both became modern independent nations soon after WWI. Thereafter Ireland was left in relative peace to develop it´s language, culture and democracy in its own way, whereas Latvia was occupied three times and fought over twice during WWII after which it suffered decades of Soviet occupation before again becoming independent. And yet … and yet … Latvians mostly speak Latvian most of the time and have retained their national self-respect throughout, whereas the Irish all speak English and seem to prefer to see themselves as imitation Brits or Americans rather than rebuild their own identity and culture. At least that´s how I would see it in J´s position, and indeed I do lean in that direction. TurdoBlurbo. Practice what you preach. You’re in no position to throw the Nazi label at Latvia, Finland or elsewhere – have you forgotten or ignorantly unaware of the (Irish) Fascist Blueshirts who marched and fought for Franco? Or Dr Valera’s condolences to the German Embassy following Hitler’s suicide? Less of your shoneen vomit please. Haven’t you expressed similar opinions in the past? It’s obvious that people who wrote the constitution wanted Ireland to be a truly bilingual country. That’s why they wrote that the Irish language is the 1st and national language. And that’s why there were attempts to revive it both before and after the independence. Unfortunately those attempts failed , but the intent was obvious. That’s what I’m pointing out – the Irish people created an England with a different flag instead. If it’s totally fine to speak English only then what’s the point of teaching Irish? What’s the point of making bilingual road signs? It’s obvious that the current govt policies + the indifference of the general public will lead to the death of the Irish language. I just find it ridiculous when people boast about “ejecting the Brits” while throwing away the language and culture of their ancestors – basically finishing the British job. Get back to us when you have an independent country. Scotland must be the only country on the planet which has actually refused independence – when offered the chance. All you had to do was to tick a box – but looks like that was too much. The Scots are a determined but cautious people. At the last moment the English broke all their own rules and changed the terms, offering ¨the next thing to federalism¨ and so on. Sadly enough folk fell for the ruse (assuming the count was fair and some have their doubts on that score) so they got the NO they needed but only narrowly, at the start they though it was a push-over. TurdoBlurbo Blueshirt. You need to chill out with that fellow Green Orangeman Grotesque George Galloway with some cat milk. ‘Respect’ indeed.